Is it wrong that we just want to talk about this bike’s paintjob? It’s a Wilier Cento10AIR disc. We all know the Cento name from 2006, when it was launched to celebrate Wilier’s 100th anniversary. The original Cento, in a sea of über-stiff, teeth-rattling carbon, delivered magical ride quality; and the Centos have remained some of the best-reviewed bikes on the planet for over a decade. 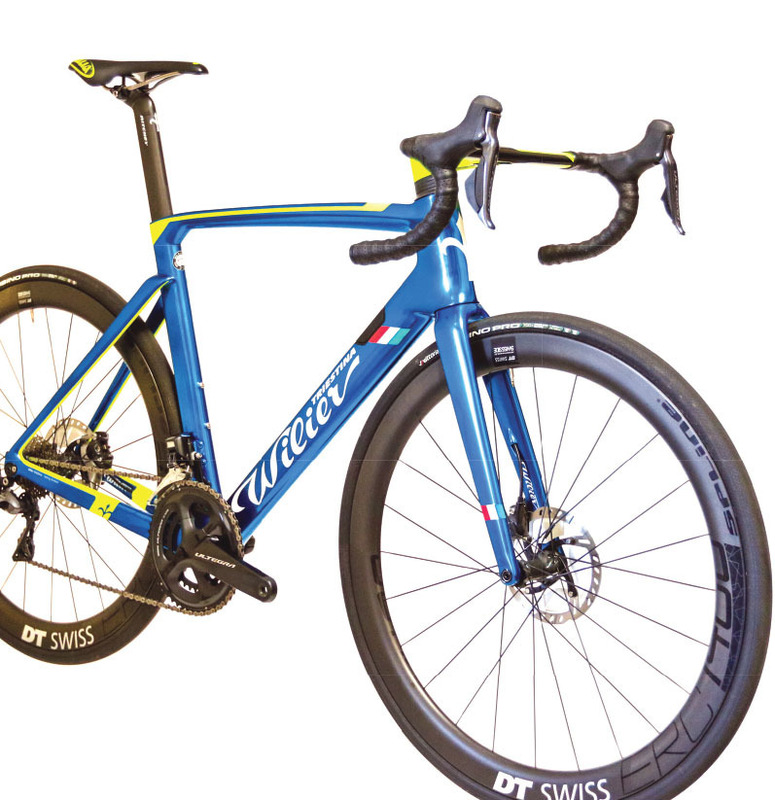 This latest member of Wilier’s storied Cento line adds disc braking to the aero Cento10AIR. Yes, it’s a good update; yes, it makes the bike a better all-around performer. But enough about that. Just look at that paint! Shimmering metallic paint is nothing new for Wilier. At the end of World War II, Wilier created chrome-plated copper—Cromovelato Ramato—frames. In 2016, the company brought back the look with a new Superleggera steel frame; and last year Filippo Pozzato’s Wilier Cento10AIR got the “ramato” treatment at the Giro d’Italia. The carbon bike has more in common with automotive finishes than the electrolysis used to plate the Superleggera in copper. A special primer is used to allow the metallic paint to shimmer like the chrome, but the link to the past is strong. The “ramato” process has also inspired the Cromovelato Azzurro of our test Cento10AIR disc. The bike appears almost lit from within, an iridescent sparkle emanating from the bike under the sun’s rays. It will create pre-ride buzz in even the most-high-rent zip codes. The fluoro accents on the frame and Alabarda integrated bar seem just right, and we’ve never said that about fluoro before. The one catch? A $1,370 up-charge for the Cromovelato Azzurro paint.